He was born in Omaha, Morris County, Texas, a town that never had much more than 1,000 residents. The 1900 census of Omaha shows “Wilson V. Taylor”, age 6, among the children of Wilson Taylor and his wife Ellen Stewart living on a farm just south of town. The 1910 census for the family lists him as “Mount V. Taylor” (either a family joke or a copying error by the census marshal.) His World War I draft registration card, which he signed as “Van Taylor” on 5 June 1917 three weeks after the Selective Service Act, gives his birthplace and current residence as Omaha, Texas and his occupation as a self-employed farmer.On 30 March 1918 he married Passie Louisa Witt (13 March 1899 –13 October 1991), a daughter of Andrew William Witt and Georgia Ann Bynum. He was drafted on 4 September 1918 as hostilities were winding down, and was sent to the Camp Travis induction center just north of San Antonio where he served as a private in the 31st Company of the 165th Depot Brigade. (Depot Brigades were induction and basic training units and the 165th was the unit for Camp Travis.) Since fighting ceased on 11 November 1918, the US sent no further troops to Europe and new draftees were evidently in a sort of limbo. Camp Travis began discharging its soldiers in November and Van Taylor was discharged on 18 December 1918 after serving three and a half months. Van and Passie were enumerated in the 1920 census in Cookville, a few miles from Omaha, with his occupation listed as store clerk in a “confectionary”. The 1930 census found them in nearby Naples, Morris County (listed under “W. Van Taylor”) living across from the railroad station. His occupation was listed as manager of a grocery store, living in a rented house for which the monthly rent was $15. Within a year or two the family moved to Daingerfield Road (U.S. Highway 259) in Omaha, not far from Louise’s future husband’s family, where they were enumerated in the 1940 census. Van listed himself as a “Groceryman”. According to the census, both Van and Passie had two years of high school. The property they lived on was a four-acre plot a bit less than a mile north of Omaha. I remember it as a pleasant house with a large screened back porch where Van loved to sleep and a screened side porch as well. While living there they took in a retarded relative. In 1902 Passie’s aunt Bessie Witt (see this family) had married Dr. Charles Wallace, a widower with a 10-year old retarded son named Dowman Edmund Wallace (21 July 1891 – 20 December 1969). Censuses show that Dowman could neither read nor write. He used a mark to sign his WWI draft card, which indicates that he was exempt by reason of “mental effection”. 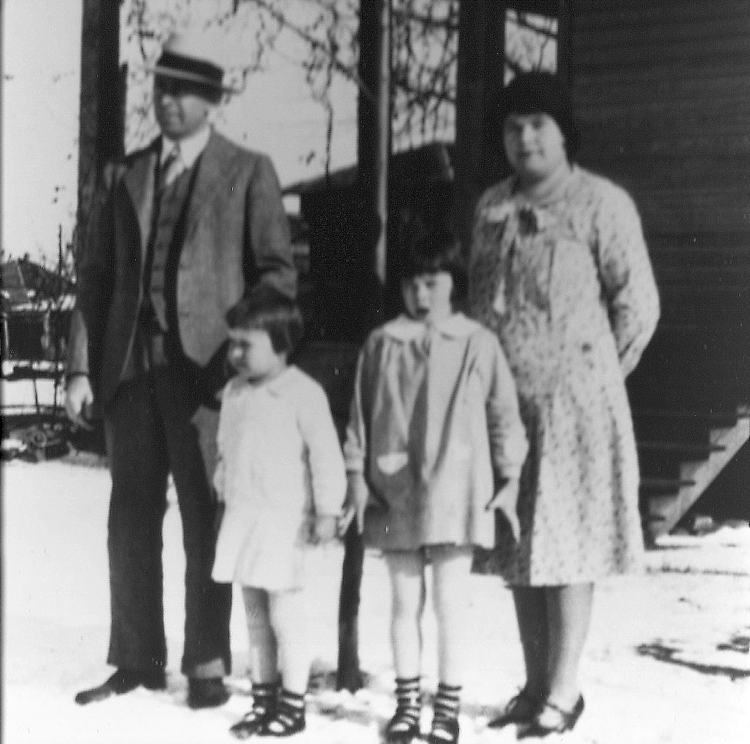 When his father and stepmother moved to Dallas they left Dowman behind to work on farms in the area. After Dr. Wallace died in 1935, Dowman’s stepmother Bessie Witt Wallace apparently arranged for him to be lodged with her niece Passie Taylor who had just moved to the Daingerfield Road property about a mile outside Omaha. Dowman Wallace lived in a one-room house on the property for the rest of his life, I remember him as a cheerful man with the mind of a child who was an enthusiastic member of the Omaha Methodist Church who enjoyed walking into town on weekends. He died in a Naples nursing home in 1969 and was buried in the Omaha Cemetery. Passie was the informant on his death certificate. Van Taylor died of a sudden heart attack in January 1965 and is buried in the Omaha Cemetery along with his wife and their daughter Virginia. 1 His widow remarried on 2 February 1968 to a widower friend named Norman Beasley, who died in 1975. Passie herself died in Longview in 1991, just a year after a family reunion celebrating her 90th birthday, and was buried in the Omaha Cemetery. Mildred Louise Taylor (4 December 1921 – ) She married her high school classmate Jack Anthony Baird (see Baird pages) and had two children: Glen Taylor Baird and Robert William Baird. Louise is currently living in Chapel Hill, North Carolina. Virginia Van Taylor (21 January 1925 – 5 February 2005) On 20 October 1944 she married her high school sweetheart Jack Milton Moore, who died in an aircraft accident in 1946, and had one child, Jack Milton Moore Jr. (later Redfearn).2 She married Arvin Redfearn on 7 September 1947, and had one child, Jennifer Lynn Redfearn. Virginia was the kindest, smartest, most considerate aunt anyone could ask for.